Crop circles appeared in a field in Salinas, Calif., but no one knows where they came from. Theories are cropping up to explain an intricate circular pattern discovered in a field of grass in California early Monday. An aerial photographer spotted the giant crop circle in Salinas, Calif., from above on Monday. 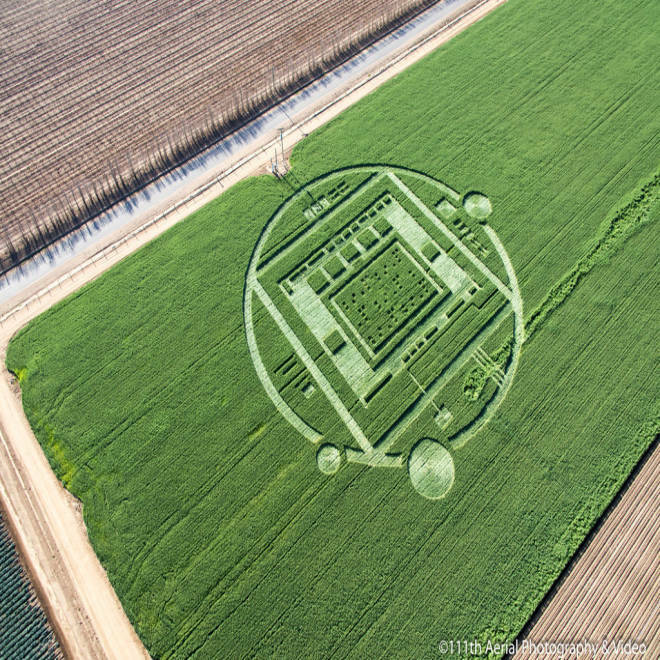 Theories are cropping up to explain an intricate circular pattern discovered in a field of grass in Chualar, California field. KSBW's Tom Miller reports. Onlookers on the ground had to make do with climbing on their trucks on an adjacent street to try and get a better view, NBC affiliate KSBW reported. “It looks like aliens to me," Manuel Madrid said from his vantage point. But there were indications that the pranksters or artists were of earthly origin. The MontereyHerald.com reported that guards from a South Bay security company were at the field Monday morning on behalf of a client whose identity they could not reveal. Meantime, a YouTube video titled “Salinas Crop Circle Discovery” posted by user “Cannot Say” showed two men driving down the road at sunrise on Monday and then spotting a blinking green light in the field. For her part, Belanger said she doesn't know who's behind the circle, or what their intent was. “I don't know what it is supposed to be ... but it is beautiful,” she said.